Secretary-General Ban Ki-moon today exhorted the world’s academic community to find solutions to global hunger and malnutrition, come up with ideas to promote sustainable and inclusive development, and advance tolerance through mutual respect and understanding. “You are all aware that people across the Horn of Africa are starving. A catastrophic combination of conflict, high food prices and drought has left more than 11 million people in desperate need,” Mr. Ban told participants at the United Nations Academic Impact Forum in Seoul, Republic of Korea. “Even as we respond to this immediate crisis, we need to deal with underlying causes. We need to focus on practical measures – drought-resistant seeds, irrigation, rural infrastructure, livestock programmes; improvements in early warning systems,” Mr. Ban told the forum, hosted by the Korean Council for University Education and Handong Global University. The Academic Impact is a global initiative that aligns institutions of higher education with the UN to actively support universally accepted principles in human rights, literacy, sustainability and conflict resolution, among others. It was formally launched at UN Headquarters in November last year and 670 academic institutions in 104 countries have since joined the initiative, including 47 from the Republic of Korea. Mr. Ban said there can be no peace, justice and dignity in the world if billions of people are forced to live in chronic poverty. “We need to focus on the links among hunger, water and energy, so that solutions to one can become solutions to all. The academic community can help us connect the dots,” he said, urging scholars to take their ideas to the UN Conference on Sustainable Development (Rio+20) in Brazil in June next year. On tolerance and peaceful coexistence, the Secretary-General stressed that the academic community, with its long-standing traditions of cultural exchange, can set an example of mutual respect and understanding. “During a period when extremism and polarization show little sign of lessening, such a contribution would be timely indeed. “So let us go forth together – students, teachers, university presidents, national governments and the United Nations – to affirm our common purpose and the partnerships that can do so much to build a better world for all,” Mr. Ban added. 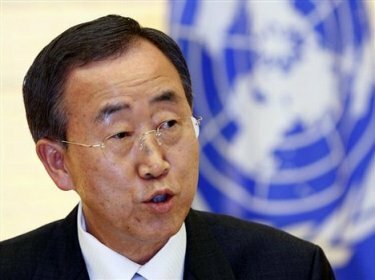 The Secretary-General said the Academic Impact had spawned an offshoot known as “ASPIRE” – Action by Students to Promote Innovation and Reform through Education – and thanked the students for their engagement, including through raising funds for relief work after disasters in Haiti and Japan. “The message is clear – there is no area of study that cannot make a difference to the United Nations and the people we serve,” said Mr. Ban. He stressed the need for unfettered sharing and exchange of human thought to promote collective solutions to common problems, integrity of research and support for academic activity.